I can’t tell you how many times we get asked how we can afford to travel and take as much time off as we do when we have traveled. Soooo I’ve decided to clarify a few misconceptions about traveling and break down some of our own travel tips on saving money. If you read any travel inspired blog posts out there about saving and budgeting, more often than not you’ll see one of their first pieces of advice is this little word, sacrifice. This means not going to Starbucks everyday before work so you can go have a cappuccino in Venice. Now I’ll be the first to admit it is by no means easy, especially if you’re me. I love to shop, I love coffee, I love to go out to eat and have date nights all around town; but I love traveling probably even more than those things so I am willing to stop spending money on potentially frivolous things so I can enjoy my life experiencing those things across the world. BUT, I can say the initial pain of not doing those things is well worth the gain a year down the road when our trip comes to full fruition. And for me, saving money is a lot less scary when you know the end goal is so sweet. So, here are some things I’d like to clarify on our past Europe trip that we get asked a lot about. 1. Yes, we have paid for both of our Europe trip 100% completely by ourselves. My dad bought our backpacks for Christmas and people gave us a little extra “tip” money at our jobs, but we fully paid for all of our expenses on our own. 2. We have super kickass jobs that allow us to make our own schedule and be flexible with our time. Well, my job more so than Kenny. As a hairstylist, I am my own boss and my clients were super flexible with letting me schedule them a week earlier or a week later so I could keep them mostly on track when I got back. [sidenote with that; I also left knowing that some of my clients would probably not be coming back due to the timing of when I was leaving and I was prepared to lose a couple people just out of ease for them, BUT I am happy to say I sure do have a loyal clientele and I didn’t lose a single one!] Now Kenny’s job is a little different, he still has a boss he reports to and it wasn’t the easiest getting a month off for him – but his tattoo clients were pretty understanding of him going to Europe and were also willing to wait to see him until he got back. 3. Our biggest help was that we had moved in with my parents due to our lease being up about 8 months before we were planning on leaving, so we got to save a lot more money. We still had daily expenses but as far as rent, utilities, and all of the “adult” stuff we were doing when we first started saving, we didn’t have to worry about it. (WOOH! Thanks Mom and Joe!) The second time around it looked a lot different for us since we’re back in a lease and being responsible adults. So, here’s a little list of some things that we have done to save a little moola! Some of them may seem a little obvious, but believe me when I say that every little bit helps and even though they may sound small – these acts can go to making a big change! ♦ We’ve been implementing a system for saving money on some of the day to day expenses. We like coffee A LOT – and when we look at our finances, we spend quite a bit of money going to coffee shops because Reno has quite a few good ones. So we’ve decided that since we have a super sweet Chemex and we like to get a pound or two of coffee from our favorite shops, we’re gonna try to not go out for coffee as much and take the money we’d use to go out and instead put it into our travel fund. Which is sweet also, cause most mornings it gives us an intentional time to spend sipping coffee with each other. Annnd it also applies to almost every area of life – instead of going out to eat out of ease and comfort, I’ve been sticking to meal planning and carving out time to go get groceries and cook dinner almost every night. Now this isn’t to say we’re being so regimented that we don’t allow ourselves spontaneous nights out with friends or an occasional coffee date, but we’re just trying to limit our expenses of going out here so we can go out while traveling. Which takes a. lot. of. sacrifice. Also applies to shopping [for me]. and shoes [for Kenny]. ♦ Another really helpful thing for us is automatically taking a percentage of our paychecks and putting it directly into our travel fund. The hardest thing for us is that I don’t necessarily have a “paycheck” since I don’t get paid hourly so it’s a little hard to budget what I’m going to make and how much I can put into savings. So this means for me that I just put my cash and all my tips into our fund – and Kenny did that same with his cash tips. (I also forgot to mention in #2 that I was also working part time at a coffee shop 2 days a week and was averaging $60-80 in tips so that automatically went to our fund also!) Now, this is actually really important to do right when you get your paycheck before you do anything else with it because if you don’t budget it out, money can be gone just like that. Another thing that is helpful is to budget out your normal monthly expenses like rent, utilities, groceries, gas, phone, etc. and figure out the bare minimum that you can live on while not starving or going crazy. I read a blog once about a girl who lived off of $500 a month for a year so all of her extra money could go towards travel. Sounds crazy, but it’s doable. ♦ PRIORITIZE. Determine your wants and your needs. I want a whole new wardrobe, but I need food instead. I want new decorations for my house, but I need gas in my car to go to work. See what I’m getting at? Somehow when you put things into perspective and have an end goal for something you really want, some of the little things don’t seem to matter as much. And don’t get me wrong, I’m not saying you have to completely limit yourself and live as a hermit to save money, but when you look at your finances, are you spending money on things you actually need? You may need to take a look at your bank account and really be honest with yourself about where your money is going and if there are things you can cut out and still survive. Life becomes a lot less complicated when you can live a little more simply. ♦ If you’re married or dating, instead of spending money to go out on dates or expensive weekends away – find fun things to do in your city that are FREE! Kenny and I really enjoy the outdoors so we tend to lean more towards going hiking or camping since you can do those for next to nothing rather than spending the time and money to go on a weekend trip to San Francisco – which we also LOVE to do. Or, this could also mean instead of taking a lot of week long trips during the year, maybe you instead do weekend trips here and there and really save up for a month long trip somewhere big. You’ll find what works best for you and do what is easiest for your budget. ♦ I’m gonna go a little more in depth about this point in an actual “planning” post – but we also decided to go in the “shoulder season” of tourism for Europe. This means, it’s not summer where everyone wants to enjoy the sunshine and things cost a lot of money, and it’s not winter where everyone wants to enjoy the snow and things cost a lot of money – its either their spring season and still a bit rainy and brisk or their fall season and still a little warm with colder nights and things cost a lot LESS money. We went in the spring this past time around and our next trip were planning for next fall which ends up working out to be way more budget friendly, so that’s something to consider. We have taken cruises and certain trips during the Christmas/New Year season to get out of the snow and these trip [cruises especially] tend to be way pricier. ♦ This goes a little off the last point and will be in the planning post as well but its important to be realistic with yourself. Maybe you financially can’t save to head to Western Europe but you can go to Eastern Europe or even places like Thailand and Southeast Asia where your money can go a lot further. We budgeted to spend about $50 a day for each of us which included all of our food and activities and lodging. Now multiply that to the 40 days we planned on being there you have $4,000 plus our airfare and added expenses before we left. [The initial plane ticket is pretty expensive, but everything in Europe was crazy cheap and within a reasonable budget.] Now some days we spent a little more, some days we spend a little less but it averaged out to be about what we thought. We left knowing we had $10,000 to spend had we needed to use it all, and our rough estimated expenses landed us around $7,000 including our flights and transportation. That’s $3,500 each to go spend 40 days in Europe – is that sounding at least a little more doable for your dream trip?! We never felt like we were limited on anything or had that feeling that we can’t do something or else we’d be “over budget”, and we were really good about keeping track of every expense so we knew where we were at financially. ♦ Pick up odd jobs when you have extra time. I have a cute family that I would babysit for and all my babysitting money went straight to the fund. I get crafty and sell some sweet necklaces in the salon and over social media, and Kenny does couple extra art jobs and sells paintings for some extra cash too. Another thing I’m trying is doing a seasonal wardrobe and getting rid of a L O T of clothes – and really deciding what I want for each season and buy clothes with a purpose in mind. That way I don’t go aimlessly shopping because more often than not I leave spending way more money than anticipated with clothes I don’t even need. So that’s my own personal way of saving money throughout the year. ♦ I’ve heard of a couple people who take it even a step further and figure out what they can cut out corporately and diy instead. For example, maybe instead of spending money on cleaning supplies or makeup, you make your own. Those two are a double winner cause you can be health conscience and save money! Or maybe you live in a town where you can ride your bike or use public transpo instead of buying gas every week or you and your spouse can ride share to work. May not seem like much, but $40 every couple weeks can add up to a plane ticket for your trip. Like I said, it’s not always going to be easy but if you want it bad enough it will be worth it. It’s more of a shift in lifestyle and patterns than just saving money to save money. ♦ I think the biggest thing for Kenny and I in saving money is that traveling is important to us. We are at stage in life where this is a big priority for us and something we really desire to do. I would say that desire and sacrifice go hand in hand – unless you’re rollin in the dough, you have to want to sacrifice some time and money for your end goal. It helps that we did have an end goal and everything we were doing had a purpose. And maybe you’re not in a season of life where travel is realistic, but in the future want to make it happen. I want to be clear with this post that it is completely doable – and waaay easier than you’d think. But it has to start here, you have to want it enough – the saving and planning is the easy part, it’s the initial jump off the ledge to get you there. Those are some of our biggest tips for saving money, do you have any you’d like to share? 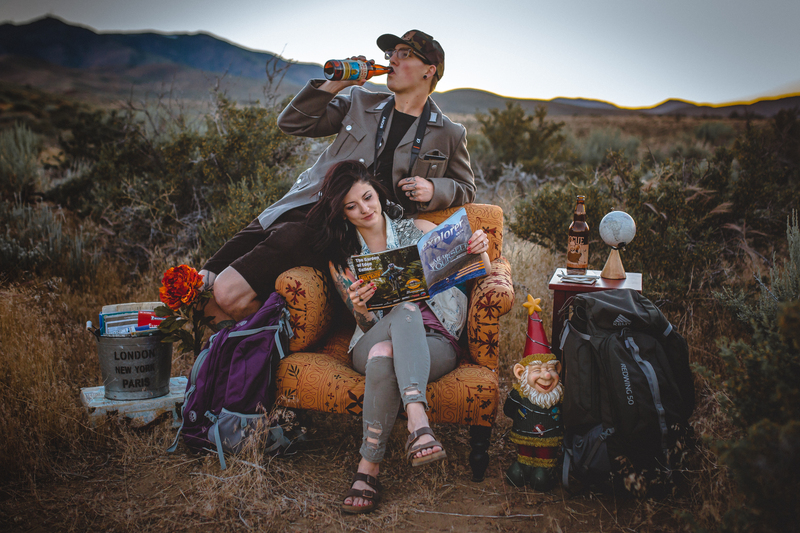 Hey friends, we are Kenny and Sadie, a couple of 20 something's who are sippin' and 'splorin our way around the globe in our backpacks. Always in search of new craft brews and the world's best cappuccino. Don't miss out on new content, delivered straight to your inbox!